Hello everyone! 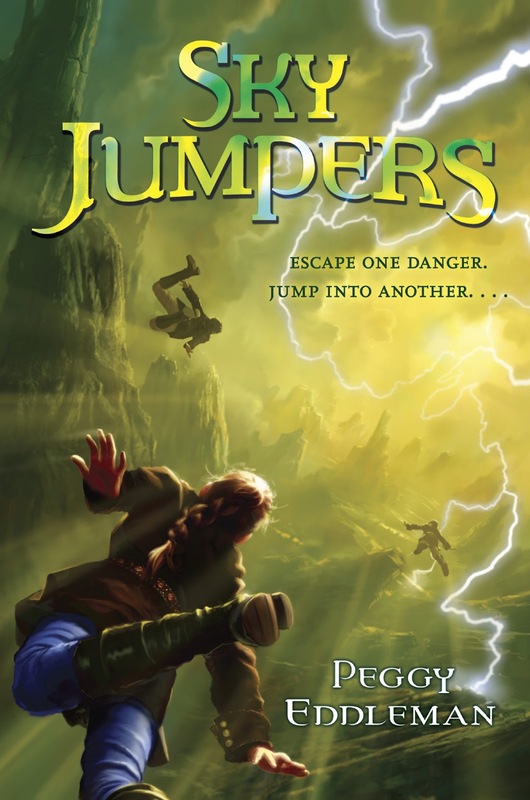 This week I'm interviewing Peggy Eddleman, whose MG debut Sky Jumpers will be released on Sept 24 by Random House Books for Younger Readers! I first encountered Peggy's success story when she appeared as a guest in Brandon Sanderson's 2012 lecture series (yes, I've raved about those often). Peggy's savvy querying advice really helped me a lot in my own search for an agent, so I definitely owe her one! Here's the dish on her fabulous sounding novel and her writing journey. Hi Peggy! Congrats on the upcoming release of SKY JUMPERS! What's the genre and one-sentence pitch? Thanks so much, Maya! It’s a middle grade adventure about a girl living in a post-apocalyptic town where she can’t do the most important thing— invent, but when bandits invade, inventing won’t save them, but the daring and risk-taking that usually gets her into trouble just might. The setting. My family and I were flying home from Disney World on a cloudy day, and I kept staring out the window at the wrong side of the clouds, imagining how fun it would be to jump into them and have them slow my fall, like jumping into water. Then the Bomb’s Breath was born— a deadly band of air 15 feet thick (a side effect from the green bombs) that covers their crater-valley. Was this the first novel you wrote, or did you drawer a few projects first? 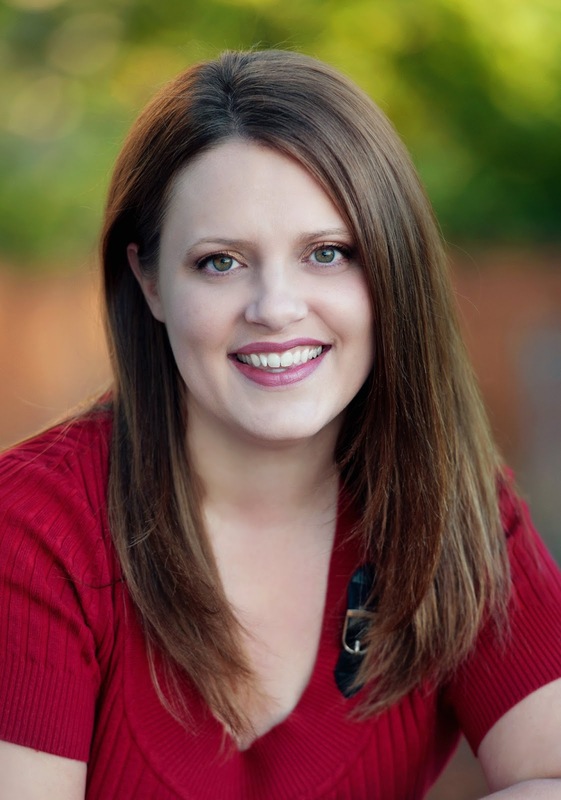 How did you initially pitch to your agent, Sara Crowe (contest, conference, query)? I pitched to her at a writer’s conference (LDStorymakers). It was my first live pitch, and it was SO SCARY! My voice shook, my hands sweated, and a third of the words fell out of my head before they made it to my mouth. Luckily, agents understand where we are coming from when we pitch, and don’t hold those kinds of things against us. :) My manuscript was finished and heavily revised at that point, but it wasn’t 100%. I pitched to her in May, but didn’t send it to her until I started querying in September. Agents are incredibly patient when it comes to waiting for an ms after a conference pitch. I completely agree. Can you tell us a little bit about your querying strategy? I didn’t start querying until I had a ton of critique partners read my ms and it was in the very best shape I could possibly make it. Then I spent 5 months writing my query. No joke. I worried that if it wasn’t as close to perfect as possible, I might lose a chance with the agent who would be perfect for me. I know lots of people like to “test the waters” to see if their query is working, but honestly, I knew I couldn’t make my query any better, so testing the waters was irrelevant. So I just went straight to the top. I signed up for Publisher’s Marketplace (which I think still might have a 5 day free membership), and had it show me the top dealmakers for middle grade. Not every uberly-incredible agent will be listed as a top dealmaker, but it’s a good place to start. Then I researched each one on Literary Rambles (LOVE that site!) until I had a list of my dream agents and was able to personalize each query. Then I took a deep breath and clicked send. How did you feel when Ms. Crowe offered representation? Peaceful. Ha! Not the answer you expected, huh? I had another offer of representation from an agent I had cold-queried. Both were in the top 3 on PM for my genre, and both had some major skills. It was a very difficult decision. Then my husband pointed out that when ever I talked to/about the other agent, I was stressed, felt inadequate, and was full of worry. Whenever I talked to/about Sara, I was happy, excited for the future, confident, and calm. So when I said yes to Sara, I felt peaceful. Like it was the most right decision ever. How did the submission process for SKY JUMPERS go? Fast. I had hunkered down for the long haul and pushed it out of my mind, because I already knew that those things take months. So I was completely caught by surprise when I got a call after six days. What has surprised you the most with the publication process? That the Insider Information doors aren’t opened, and all the info you ever needed to know doesn’t just flow to you. It takes a lot of figuring things out as you go. I am incredibly grateful to be a part of the Lucky 13s, because when you take the little bit of info we each know and add it all together, it makes for a much clearer picture of everything. (Plus, it’s a great support to be around people who are going through the same things!) I highly suggest becoming part of a group of other newbie authors when you get a book deal. It makes it feel like you’re not fumbling around in the dark. What was the biggest challenge you faced after closing the deal? Book 2. Book twos are beasts. Beasts that are hard to get just right, and that frequently have to be rewritten. It has taken a lot to tame that beast. Did you have a web presence before signing with Random House? Yes. I had a blog that I had invested a lot of time in before querying. How did you build your web presence? By writing consistent content with the blog reader in mind, and by visiting a LOT of other blogs. Not only did it help to build my web presence, but it made me feel a part of the writing world, and introduced me to some amazing writing friends, many of whom I’ve been able to meet in real life. I don’t think that blogging made a huge difference to my publisher, but it made a huge difference to me. What are you most looking forward to post-release? What's your current favorite MG book and why do you love it? Gregor the Overlander. ‘cause it’s amazing... like my son Cory. (Haha! My son typed that while I wasn’t looking, and now I can’t bring myself to delete it.) I love Gregor because it was full of incredible conflict and interesting characters and a very unique setting. And because it completely captivated my kids. We tore through the entire series in record time. It’s one of the few series that my kids have asked me to re-read to them. I truly believe that there is a perfect publishing path for everyone, whether it’s Big 5, a medium-sized publisher, a small press, self-publishing, or if it’s strictly for hobby and will forever stay hidden in the quiet corners of your hard drive. Each one has its own set of pros and cons. Figure out what your perfect path is, and then plow forward with that goal in mind. Don’t let anything stop you. Not fear of your own inadequateness, or jealousy over someone else’s path, or obstacles that stand in your way, or naysayers, or even the sheer difficultness of the task. Just remind yourself that THIS is the perfect path for you regardless of what’s perfect for anyone else, and that YOU CAN DO IT. Fantastic answers, Peggy! Thanks so much for your time! 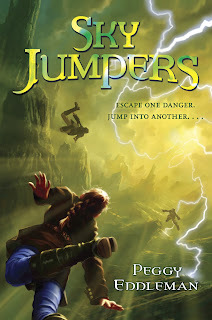 And I can't wait to read SKY JUMPERS! And thank you so much for having me, and for coming up with such great questions! I have loved being here.